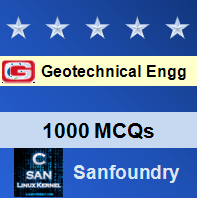 This set of Geotechnical Engineering Multiple Choice Questions & Answers (MCQs) focuses on “Modes of Occurences of Water in Soil”. Explanation: Since the ground water is subjected to no forces other than gravity. Hence the water is also known as gravitational water or free water. Explanation: Soil water is the water present in the voids of the soil mass. 3. Hygroscopic water is affected by which of the following factor? Explanation: Since hygroscopic water has greater density and viscosity than ordinary water. It is neither affected by gravity or capillary forces or by any other force. 4. What are the forces involved in hygroscopic water or contact moisture? Explanation: In hygroscopic water, soil particle freely adsorbs water from the atmosphere by the physical force of attraction, and is held by adhesion force. Explanation: The average hygroscopicity of sands, silts and clay is 1 %, 6 % and 16 %. Explanation: Infiltrated water is the portion of surface precipitation which soaks into ground moving downward through air-containing zones. Explanation: Adsorbed water which is attracted by forces within the soil and pore water are the two types of soil water divided based on inter-particle forces. 8. Solvate water is subjected to __________ forces. Explanation: Since the solvate water forms a hydration shell around soil grain. It is influenced by ionic and polar forces. Explanation: Under loading encountered in soil engineering, it is found out that structural water cannot be separated or removed and therefore it is considered as a part and parcel of the soil particle. 10. Ground water is influenced by ____________ force. Explanation: As the ground water obeys laws of hydraulic force, it is capable of moving under hydrodynamic forces. 11. Water can be classified in to __________ types based on structural aspect. Explanation: Structural classifications of water in a soil are 4 types, which are: pore water, solvate water, adsorbed water, structural water.